Cardinal Müller says "Amoris Laetitia" is "very clear". The bishops of Malta say divorced and remarried Catholics can receive Communion. Abps. Chaput and Sample say otherwise. Welcome to Pope Francis’ messy Church. Just yesterday I was lamenting to some colleagues about how weary I’ve become of the ongoing and escalating debate over Amoris Laetitia and its interpretation. “I would be happy,” I said, “to not write of it again.” Knowing full well the topic was not going away. Quite the contrary. So, I am not happy. But this really isn’t about feelings, is it? Or is it? 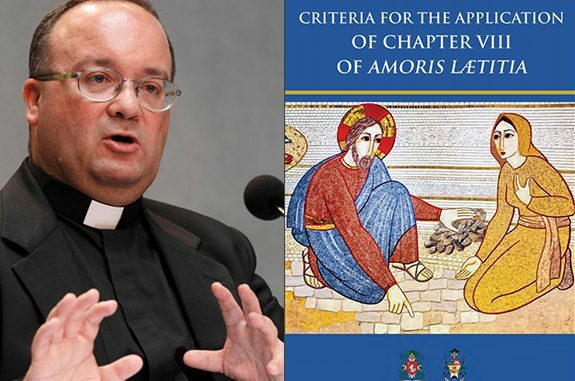 The bishops of Malta, in a pastoral letter signed January 8th by the Archbishop of Malta, Charles J. Scicluna, and the Bishop of Gozo, Mario Grech, have offered their “Criteria for the Application of Chapter VIII of Amoris Laetitia”. This document was, it is important to note, also published on pages 7 and 8 of the January 14th edition of L’Osservatore Romano, which has long been considered the semi-official newspaper of the Vatican, described by Cardinal Tarcisio Bertone in 2006 as “an instrument for spreading the teachings of the successor of Peter and for information about church events”. While authentic pastoral care always accompanies people in their suffering and frailty, some have misused the Exhortation’s rightful insistence on the logic of mercy to claim that objectively wrong acts can be accepted, even perhaps sanctified, if a person judges he or she cannot do differently. Not only does this misapply mitigating factors for subjective responsibility with determinations of objective rightness, but it empties the cross of its power. Claiming that individuals cannot change their ways is tantamount to denying the efficacy and power of grace, of denying that God can do what he promises. 9. Throughout the discernment process, we should also examine the possibility of conjugal continence. Despite the fact that this ideal is not at all easy, there may be couples who, with the help of grace, practice this virtue without putting at risk other aspects of their life together. On the other hand, there are complex situations where the choice of living “as brothers and sisters” becomes humanly impossible and give rise to greater harm (see AL, note 329). That is, those Catholics who have a sacramental marriage but are divorced and have procured a civil marriage are able and should receive Holy Communion if they they are “at peace with God”, seeing that they it is impossible for them to refrain from sexual relations. Full stop. Put another way, this really is about feelings and subjectivity. Period. At least according to certain bishops and pundits. In recent years, in various regions, different pastoral solutions in this area have been suggested according to which, to be sure, a general admission of divorced and remarried to Eucharistic communion would not be possible, but the divorced and remarried members of the faithful could approach Holy Communion in specific cases when they consider themselves authorized according to a judgement of conscience to do so. This would be the case, for example, when they had been abandoned completely unjustly, although they sincerely tried to save the previous marriage, or when they are convinced of the nullity of their previous marriage, although unable to demonstrate it in the external forum or when they have gone through a long period of reflection and penance, or also when for morally valid reasons they cannot satisfy the obligation to separate. In some places, it has also been proposed that in order objectively to examine their actual situation, the divorced and remarried would have to consult a prudent and expert priest. This priest, however, would have to respect their eventual decision to approach Holy Communion, without this implying an official authorization. In these and similar cases it would be a matter of a tolerant and benevolent pastoral solution in order to do justice to the different situations of the divorced and remarried. Even if analogous pastoral solutions have been proposed by a few Fathers of the Church and in some measure were practiced, nevertheless these never attained the consensus of the Fathers and in no way came to constitute the common doctrine of the Church nor to determine her discipline. It falls to the universal Magisterium, in fidelity to Sacred Scripture and Tradition, to teach and to interpret authentically the depositum fidei. With respect to the aforementioned new pastoral proposals, this Congregation deems itself obliged therefore to recall the doctrine and discipline of the Church in this matter. In fidelity to the words of Jesus Christ, the Church affirms that a new union cannot be recognized as valid if the preceding marriage was valid. If the divorced are remarried civilly, they find themselves in a situation that objectively contravenes God’s law. Consequently, they cannot receive Holy Communion as long as this situation persists. (emphasis added). Certain currents of modern thought have gone so far as to exalt freedom to such an extent that it becomes an absolute, which would then be the source of values. This is the direction taken by doctrines which have lost the sense of the transcendent or which are explicitly atheist. The individual conscience is accorded the status of a supreme tribunal of moral judgment which hands down categorical and infallible decisions about good and evil. To the affirmation that one has a duty to follow one’s conscience is unduly added the affirmation that one’s moral judgment is true merely by the fact that it has its origin in the conscience. But in this way the inescapable claims of truth disappear, yielding their place to a criterion of sincerity, authenticity and “being at peace with oneself”, so much so that some have come to adopt a radically subjectivistic conception of moral judgment. Yes, a crisis of truth. Again and again, it is clear to me that this pontificate is working to undermine and dismantle key aspects of the teaching of Saint John Paul II. As one correspondent, well-versed in the writings of John Paul II and the current situation, recently wrote to me: “It is one thing for Pope Francis to have canonized Saint John Paul II … but was this a case of ‘promote to remove’ (promoveatur ut amoveatur)? Yes, let us honor him with canonization but disregard his teachings…” And, again, it must be emphasized that what John Paul II taught on these matters is in complete accord with two thousand years of Tradition and practice. The current papacy of sentimentality has produced confusion and conflict. As Cardinal Caffera states in a recent interview, “Only a blind man can deny that there is great confusion in the Church.” The clarity that Cardinal Müller speaks of so strongly is not just lacking, it seems to be absent altogether. There are directly competing interpretations of Amoris Laetitia: some by “conservative” prelates who refer to the perennial teachings of the Church and some are by progressive bishops who refer only to Amoris Laetitia and are published in the Vatican newspaper. The Pope’s Exhortation may not always be clear, but his intentions and goals are increasingly so.